This is set on planet Krypton, centuries before Superman's birth. His ancestor Val-El (Ian McElhinney - Game of Thrones ), a political dissident, is executed by the Government. Yes, the city of Kandor is a dystopia - specifically a religious dictatorship. Fourteen years later, the dead man's grandson Seg-El (Cameron Cuffe) is a young rogue who hangs around with Kem (Rasmus Hardiker - Your Highness ). The duo are recruited by Adam Strange (Shaun Sipos - Dark Matter: S2 ), a time-traveller from Twenty-First Century Detroit. Seg-El (Cameron Cuffe) wants to take revenge on Daron-Vex (Elliot Cowan - Frankenstein chronicles ). Adam Strange (Shaun Sipos - Dark Matter: S2 ) reminds him of his higher duty, to prevent Brainiac from destroying Krypton. Luckily, Seg-El's new job as a scientist should make that easy. However, the Government technology is not good enough to detect Brainiac yet. The only computer powerful enough is the secret one in the Fortress of Solitude, which was built fourteen years ago. Yes, Moore's Law does not apply in Kandor. Strange and Rem go out looking for meteorites. Hopefully some proof of Brainiac's existence can be found. Lyta-Zod ( Georgina Campbell ) wants a promotion. Unfortunately the only way you can get one in the Sagitari is if you defeat your commanding officer in a duel to the death. Yes, she must defeat a man who is taller, stronger and more experienced. The Brainiac probe has infected a woman in the slums. Its mission is to access the local communications system so it can send a message back to Brainiac. Lyta-Zod ( Georgina Campbell ) is given her first mission as a commander. Her unit must clear the poor people out of the slums. Naturally, it all goes horribly wrong. Seg-El goes looking for an arch-terrorist (Colin Salmon - Arrow: S1 ) who has links for Black Zero. Lyta-Zod ( Georgina Campbell ) stands trial for the mess in the previous episode. The reality is that she did a good job, but is now a pawn in political games. Will her mother, Primus Jayna-Zod ( Ann Ogbomo ), agree to help Daron-Vex (Elliot Cowan - Frankenstein chronicles ) to take over the Government? Vex may be a creepy back-stabber, but he actually seems more reasonable than the religious fundamentalist in charge of Kandor. 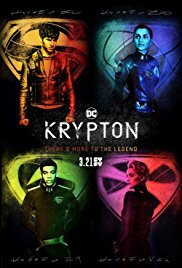 Seg-El and Zod team up with the arch-terrorist (Colin Salmon - Arrow: S1 ), and go off in search of a secret doomsday weapon. Adam Strange (Shaun Sipos - Dark Matter: S2 ) gets chained up and left behind, because he with-held info from the others. Back in Kandor, Daron-Vex (Elliot Cowan - Frankenstein chronicles ) and the conspirators continue their plot. What they do not know is that the Face of Rao is not merely a religious bigot and totalitarian despot. Worse, he has been taken over by Brainiac! Seg-El and Zod arrive back in Kandor, unaware of the reason for the massive security clamp-down. Radimus gives them some exposition - Lyta is scheduled for execution for her part in the plot. Seg goes to save her, despite her only being his arranged bride Nyssa Vex ( Wallis Day ) and the fact she blackmailed everyone. It turns out that she does not really need his help. Daron-Vex (Elliot Cowan - Frankenstein chronicles ) has been enslaved by Brainiac. It has not lobotomised him, but its sensors have a lie-detector mode and if he tries to decieve it then it will kill him. However, he is just as much a victim as anyone. Adam Strange (Shaun Sipos - Dark Matter: S2 ) has been left at the Fortress of Solitude, where he and the hologram of grandpa El (Ian McIlhinney - Game of Thrones ) try to repair his intergalactic teleportation device. Zod and his grandma visit the Black Zero leader - yet another Matriarch. She gives them her version of You're either for us or you're against us - originally said by Neo-Con George W. Bush but now the unofficial motto of AntiFa. In her mind, the Guild system is to blame for everything. If the skilled labourers were no longer in charge, the unskilled masses would be able to take over. Adam Strange (Shaun Sipos - Dark Matter: S2 ) tries to correct his mistakes. He makes a deal with Vex, possibly to help him double-cross Brainiac. The body of one of Brainiac's brainwashed troopers is taken to the Fortress of Solitude, where the girls and the hologram of grandpa El (Ian McIlhinney - Game of Thrones ) try to hack his transceiver. Their plan is to distract Brainiac.